So I think I was like the only person in the world who didn't loooooove E. Lockhart's (pen name for American author Emily Jenkins) previous novel, We Were Liars. I wanted to, I really did, but it just wasn't wow for me. 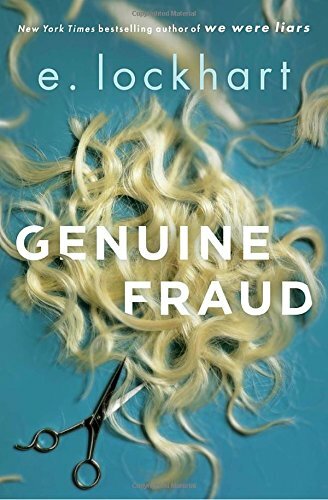 I wanted to give her another chance (and was admittedly drawn in by the gorgeous cover) so I picked up Genuine Fraud in the hopes that I would be converted, after all the hype surrounding her books. Ok so hear me out, this book had a lot of unique characteristics that once I got used to, I really enjoyed. The story of Jule is told...backwards. So the book opens with Chapter 19; Jule is in a posh resort in Mexico and is obviously hiding out (from what/who? we don't know) and has been "made" by a detective. She flees the resort, hiding out in the slums of Mexico, trying to figure out her next move. Each chapter takes us back a few weeks, each chapter ending up where the previous one has begun. Are you following me? So the mystery of the novel is figuring out the "where it all went wrong" because it's very obvious, something is terribly wrong. Jule is a chameleon, you're never really sure what you're getting with her, or where her story will end up taking you. Jules backstory definitely took a much different turn than I was anticipating. If a Singe White Female storyline is your jam- I think you would find this entertaining. I will say it would not have been nearly as entertaining if read backwards to forwards- the whole point of the mystery would have been lost. Overall I would recommend this one, it was a very unique reading/storytelling experience. The mystery was intriguing, kept me riveted and eager for more. There is no neat, wrapped nicely with a bow ending, (So if you are the kind of reader who needs everything finished up and over by the end, this one isn't for you) but was satisfying and fitting. Anyone else read Genuine Fraud? What did you all think? Love it or hate it? Let me know in the comments!